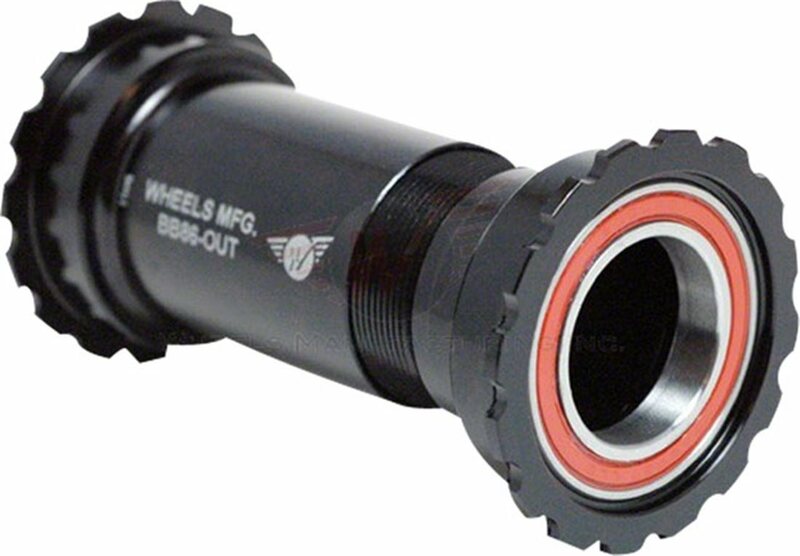 Replace your OEM BB86 bottom bracket with the Wheels Manufacturing Outboard BB86/92 unit, and find yourself with a nice list of upgrades. When using your existing 24/22mm cranks, such as SRAM or Truvativ, you'll have Enduro ABEC 5 Angular Contact bearings working in your favor, as well as double-lip seals throughout. No plastic here either, the machined aluminum does a much better job of preventing squeaks. Note: Install only with bottom bracket tools compatible with 16-notch MegoEvo BB's, such as FSA MegaEvo and Park Tool BBT-29. Bottom bracket works as promised. It is a great solution to the BB92 creaking issues that you may or may not be having. Fit up with my Saint cranks perfectly. HOWEVER...based on the BB design I thought I could simply use the standard Shimano external BB tool to install the BB. This was not the case. Although the pattern of the bottom bracket matches the shimano bb tool, the diameter if the bb is about 0.25" bigger than the tool. I was able to get the bb installed using a home brew solution but...keep this in mind when buying the BB. I made an assumption based on the thumbnail image and was wrong. I have WM BB's on all of my bikes and love them... no noise so far on my Carbine SL, Tracer or Chameleon. This bb is confidence inspiring! Very solid! U don't need a press, just the one mega evo bb spanner. Make sure to grease the cups good and don't expect it to turn easily. Once snugged up this bb is solid and smooth. Definitely recommend it! Great replacement for useless press-fit bottom brackets! Easy to install (with the right tools), immediately eliminated annoying creaking from carbon framed bottom bracket shell, we'll see how it does in the long run, but it's easily serviceable for future maintenance. Build quality is excellent. Machining fit my frame perfectly. It gets 3 stars only because both Jenson and Wheels' own site say the Shimano version is fsa compatible and it's not. If you have fsa cranks try another model. FSA Mega Exo is cross compatible with Shimano. FSA's own site even states Mega EXO is compatible with Shimano. would this fit a giant trance advanced 1 2015 that has a sram gxp?